Over 160 reading passages for the ENTIRE year! 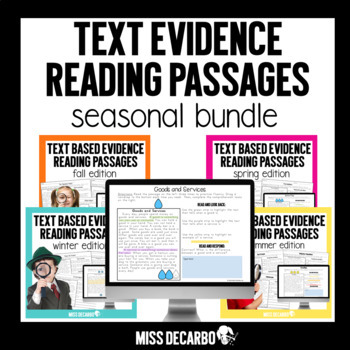 This reading comprehension bundle pack includes all four of my seasonal Text Based Evidence Reading Passages in one discounted bundle! These passages are the perfect combination of reading and learning engagement. How will these passages benefit my students? Your students will tackle close reading skills, comprehension, fluency, vocabulary skills, and written response skills...all within ONE reading passage! With the introduction of the Common Core standards, comes a big shift in students being able to not only comprehend text but use and state evidence directly from the text to support their understanding. 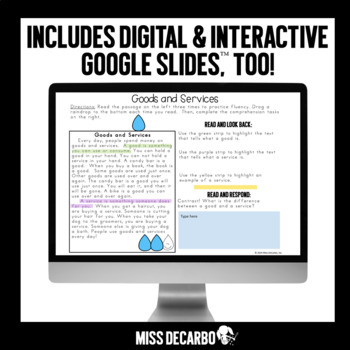 These passages allow your students to build and practice this skill in a FUN way! When can I use these reading passages in the classroom? These reading passages are perfect for small group reading, RTI, intervention, Tier 2 and Tier 3 intervention groups, independent reading, homework, and as close reads or stretch texts. Which students will benefit from these passages? The passages are written within the second and third grade reading range, making them perfect for first grade stretch texts/close reads or first grade students reading above grade level, second and third grade independent reading, below-target third grade readers, at-risk fourth grade students, intervention students, and small group settings. You can download the free preview file to see sample passages and assess whether or not the reading level will work well for your group of students. What topics do these passages cover? Each seasonal reading pack that is included in the bundle contains high-interest topics that integrate many science and social studies concepts, saving you time and resources! Practicing fluency and comprehension has never been so fun for students – and easy for educators! Are the reading passages paired? YES! Each of the four seasonal packs come with 44 high interest passages. Each topic contains a fiction and nonfiction paired passage. This allows you to help students make connections across the genres. YES! Download the Preview File for FOUR FREE PASSAGES to try out and use with your students. I hope enjoy these reading passages!